​Born and raised in St. John's, Florida, Adele currently serves at the studio graduate assistant at Baylor. Adele received her Bachelor of Music in Trombone Performance degree from Florida State University, where she studied under Dr. John Drew and performed with the University's Philharmonia Orchestra, Wind Orchestra, and Symphonic Band. While living in Tallahassee, Adele performed frequently as a pit musician with the Quincy Music Theater as well as the Florida State School of Theater. She also performed with the Sinfonia Gulf Coast as a substitute musician. In 2017, she was selected to be a student at the Domaine Forget International Music Festival where she performed for Jesper Sørensen of the Berlin Philharmonic and Peter Sullivan of the Pittsburgh Symphony Orchestra. In addition to performing, Adele enjoys the pedagogical side of the trombone. She taught music lessons at Raa Middle School in Tallahassee, and has served as a brass technician for multiple seasons of marching band at Melbourne High School in Melbourne, Florida. Nathan Taylor is originally from Midland, Texas and was graduated from Baylor University in 2010 with a bachelors in Music Education. He taught middle school band in Odessa, Texas from 2010 to 2016 and then moved to Buda, Texas (10 minutes south of Austin) to open a new middle school. He was the head band director there until returning back to Baylor University to work on his MM in Conducting. Nathan is married to Michal Taylor, also a Baylor graduate, and together are welcoming their first child in September of 2018. Kennedy Powers is a Graduate student of Church Music at Baylor and also the Graduate Teacher Assistant to Alex Parker, Director of the Jazz Program at Baylor. Kennedy graduated from UNT with a Jazz Studies degree with a concentration in Trombone Performance. He has performed in different award-winning ensembles like the One O Clock Lab Band, U-Tubes, and the Latin Lab Band. He has recently worked at First Euless as a worship intern and currently plays in the orchestra at First Woodway. In his time at Baylor, Nick has performed with the Symphony Orchestra, Wind Ensemble, and Jazz Ensemble. He also performed with the Baylor Jazz Consort; a jazz trombone group that was named runner-up in both the 2017 and 2018 International Trombone Association Kai Winding Competition. In regards to competition, Nick was named the winner of the 2017 ITA Larry Wiehe Solo Competition and a finalist in Baylor’s 2018 Semper Pro Musica Solo Competition. This past summer, Nick attended the Texas Music Festival Orchestra and studied under Houston Symphony principal trombonist, Allen Barnhill. Nick has also performed with the New World Symphony and with the Waco Symphony as a substitute musician. Nick teaches privately in the Waco area and has taught at the French Woods Performing Arts Festival. ​When he’s not practicing, Nick enjoys running, getting iced coffee at the Moody Library Starbucks, and studying music history. 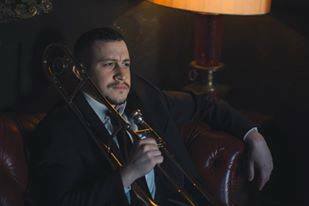 His trombone inspirations include James Markey, Peter Moore, and Achilles Liarmakopoulos. His favorite composers include Tchaikovsky, Brahms, and Reich, but his favorite orchestral work is Rachmaninoff’s Symphony No. 2. Nick hopes to end up in the orchestral scene or teaching collegiate trombone after further study in performance at the graduate level. Brandon Johnson is from a small town in Crowley, Texas. Being inspired by his high school success with trombone, he decided the pursuit of music was the right step for his college career. Brandon strives for success as a unit rather that individually. His main focus is to not only to be successful himself, but place himself in a position to be able to help others around him succeed as well. He is a consummate musician and an engaging performer in many ensembles at Baylor, playing in the Baylor Symphonic Band, Baylor Concert Orchestra, Baylor Concert Jazz Band, and Baylor Jazz Ensemble. Brandon has been very active as a leader in the athletic band, taking part in practically all the athletic groups such as the Golden Wave Marching Band, Baylor Courtside Players, and Baylor Volleyball Band. He's excited for the season to come, as he now serves as a Drum Major for the marching band. Rachel is a junior from Marietta, Georgia. In high school, she was a member of the District 12 honor Band, Georgia All-State Band, and District 12 Honor Symphony. ON top of playing in her school’s symphonic band, symphony orchestra, and jazz band, Rachel served as Drum Major of her marching band for two years. Rachel was also the first president of her school’s chapter of the Tri-M Music Honor Society. After high school, she worked on staff at her high school’s band camp teaching marching as well as trombone and baritone sectionals. In the summer of 2017, she was privileged to serve as a SWAG volunteer at the Music for All Summer Symposium, helping with the Drum Major track. Rachel hopes to one day be either a high school band director or a music and arts minister at a church. In her free time, Rachel enjoys spending time with friends and family, creating recording projects on Garageband, and watching Netflix. Collin Napper is a graduate of Byron Nelson High School in Trophy Club, Texas. For three years, he played trombone in the Greater Dallas Youth Orchestra. He had the wonderful experience of touring and performing in China with the GDYO in 2015. Prior to that, Collin was a member of the Lone Star Youth Winds. He was a two-time TMEA All-State Band member, and played trombone in his high school’s wind ensemble for 4 years and in the jazz band for three years. Collin was presented with the 2015 Outstanding Performer award for BNHS Band. Collin has a strong pedigree and a tenacious competitive spirit. This past summer, Collin performed with the Trombone Choir of North Texas, a group founded by Baylor alumnus Christian Paarup. Collin is also an active member on Phi Mu Alpha Sinfonia Gamma Iota Chapter. In his free time, Collin enjoys playing basketball, listening to 90s hip-hop music, and playing with animals. Derek Moseley comes to Baylor from the great city of Houston, Texas. He has performed in the American Festival for the Arts and the Houston Youth Symphony. He studied chamber music performing throughout the city with outreach performances and lobby performances in Houston's Jones Hall. Derek's passion lies in the orchestral repertoire and he enjoys working orchestral excerpt passages. This past summer, Derek performed with the National Symphony Orchestra Summer Music Institute in Washington, D.C. at the John F. Kennedy Center of Performing Arts. Derek strives to model his playing after many of his favorite trombone aspirations. A few of these include Toby Oft, Joe Alessi, Jörgen van Rijen, Massimo la Rosa, and Jesper busk Sorensen. When Derek isn't practicing trombone around the clock, he enjoys running or watching lots of Netflix. Jonathan Passmore hails from Arlington, Texas. As a student of Art, Choir, Band, Drama, Orchestra and Taekwondo, his love of instrumental music has taken the forefront. Throughout his Secondary and High School years, Jonathan’s artwork has been on display in the school’s gallery and T-shirts he designed. With his Honor Choir, he performed at Carnegie Hall, had leading roles in several Drama presentations and earned a Black Belt in Taekwondo. His most rewarding achievements, however, have been playing the bass trombone. Jonathan earned many First Division ratings in solos and ensembles at both TAPPS and UIL. Jonathan was successful multiple times at the regional level. As a senior in high school, Jonathan garnered 1st Chair spots in the Region 5 Wind Ensemble, TMEA Area B, and the Texas 5A All State Band. While attending Baylor University, Jonathan will be pursuing a degree in both Music Performance and Composition, studying trombone with Brent Phillips and composition with Scott McAllister. Be on the lookout for Jonathan Passmore, and if you hear "Fountains of Rome" bursting from a concert hall, duck and cover! ​Connor Wooley is a sophomore Music Performance major from Denton, Texas. He has participated in his high school’s wind ensemble, orchestra, and jazz band. In addition to succeeding at the region and area levels all four years, he was a two-time member of the Texas All State band. As a senior, he earned first chair at the State level. Furthermore, he was a featured soloist at the final concert in both 2016 and 2017 at his school, and was a recipient of the John Philip Sousa Award. In his free time, Connor enjoys spending time with close friends, watching old movies, and listening to all kinds of music. ​Jaewoo is a sophomore from Saratoga, California, where he participated in wind ensemble, symphony orchestra, choir, jazz band, and pit orchestra. He had the amazing experience of leading his marching band as a drum major during his senior year there, and performed as a soloist with his high school’s wind ensemble twice. Jaewoo was a member of the CBDA All-State Honor Band for 4 years, and also played with the Honor Band of America in 2016. Jaewoo enjoys writing and arranging music, learning about technology, and playing basketball in his spare time. Zachary Bell is a Freshman Music Composition Major from Boerne, TX. In high school, Zachary was a trombonist in the YOSA (Youth Orchestra of San Antonio) Philharmonic for 2 years, and was privileged to be able to perform repertoire ranging from Tchaikovsky to Holst to Philip Glass in a full orchestra setting. YOSA provided great opportunities and collaborations, such as playing with the San Antonio Symphony and premiering compositions by modern composers. Zachary is looking forward to studying under Dr. Scott McAllister in composition, and working with Professor Brent Phillips to continue his growth as a musician. In the future, Zachary hopes to either support himself as a composer or teach Music Theory/Composition at the university level. ​Camden Brown is a freshman music performance major from Bridge City, Texas. He was an active member of his high school’s wind ensemble, jazz band, marching band, and jazz combo, but has also performed with numerous orchestras, church worship bands, and various chamber ensembles. Camden is a four-year TMEA All-State member and has also won multiple TSSEC Outstanding Performer Awards for both trombone and the Music Theory Exam. His senior year of high school, Camden placed as the first alternate in the 2018 TCU Trombone Summit High School Solo Competition and also won first prize in the Symphony of Southeast Texas Concerto Competition with “Concerto for Trombone” by Gordon Jacob. Camden enjoys listening to and performing every genre of music, but he is especially passionate about orchestral music and trombone solo repertoire. He hopes to one day win a major performance job and/or teach trombone at a collegiate level. From Rockwall Texas, his love for music began in elementary school and has only expanded from there. Throughout high school, Dawson participated in his school's wind ensemble and jazz band as an ensemble member and soloist, as well as a violist in the school's orchestra. During his senior year Dawson was also the drum major for the school's marching band. In addition to school band, Dawson has participated in the Texas All State Symphonic Band, Jazz Ensemble I, and Philharmonic Orchestra. He was a member of the Greater Dallas Youth Orchestra for three years, has performed in Carnegie Hall, and has performed with various musical groups including the Dallas Winds and the Dallas Symphony Orchestra. In his free time Dawson enjoys spending time with friends, playing games, rock climbing, and listening to all types of music.